For skiers and snowboarders, Alaska can be exotic, exciting and enticing. 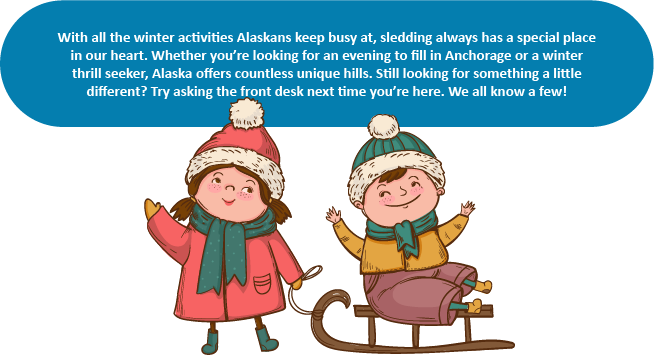 Our beloved Alyeska Resort in Girdwood offers world-class slopes and has hosted the US Alpine Championships twice in the last decade. Locals enjoy local hills situated throughout town and even groomed trails for cross country skiing. Skiing and snowboarding are part of the culture here and finding friends to go with, probably, will never be hard. With all these serious opportunities, it’s easy to forget more lighthearted sports. Odd questions and requests are my favorite part about working in the hospitality industry, and yesterday someone asked after good sledding hills. After a quick search, I was pleasantly surprised to find a wealth of resources that I would have never thought there. Hills range from bunny slopes to legitimate mountain tops. ← Bears, Bears and more Bears!